The challenge at De Stempelwinkel is asking for animals. I'm joining in the fun with this card that features a hummingbird. Also posting for the Designs By Ryn customer creations challenge. Lucky for me, De Stempelwinkel stocks stamps and stencils by Ryn. I made this gold/brown background some time ago using acrylic paints and some sprays. The leaves in the corners have been made with Ryns Maidenhair Fern stencil and Gloss Gel. I stamped some background elements (far eastern text) and the sentiment. These are both from Rubber Dance art stamps. 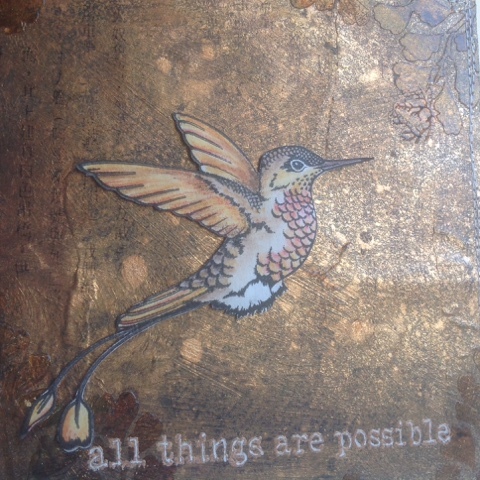 Keeping to the brown colours, I used Mixed Media Inks Honey embossing powder on the sentiment and added highlights with a white Sharpie. The hummingbird (also by Ryn) was stamped on a separate piece of paper, coloured with Inktense pencils and water, fussy cut and adhered with low foam tape. 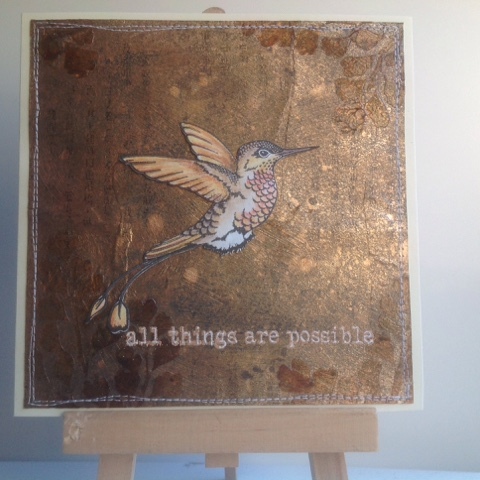 A beautyful card, thank you for joining the challenge at De Stempelwinkel! Hey Kristiina, this reminds me of the Sitting Hummingbird piece that you did. That rich background is stunning! Great colouring on the hummingbird too! Nice card thanks for joining us at the Stempelwinkelchallenge.